I can come to your book club for free if I can easily get there from here. I’m always happy to read a little and talk about my book or books. What is a poem? What is free verse poetry all about? How can you call it a poem if it doesn’t rhyme? What’s the history of poetry (briefly!)? Who are the great poets, and why? What’s going on in the contemporary poetry world? What makes a good poem? What makes a bad poem? What’s the process of writing a poem, and of reading a poem well? I’m happy to give a poetry reading for your group. Typically, a poetry reading lasts about 45 minutes, leaving a little time afterward to discuss poetry and/or answer questions. I can bring books to sell, or you can arrange with a local bookstore to have them at the reading. I’m charging these days only for trips away from the area. The fee is negotiable depending on the group’s financial situation, and the distance I’ll need to travel. Please contact me directly about the possibility of giving a poetry workshop. My papers—drafts, notebooks, letters—are housed in Special Collections at Morris Library, The University of Delaware, Newark, Delaware, 19716. They are available for students and researchers. I will continue to add to the collection periodically. Central Lake, Michigan, Book Club meets in the District Library to discuss Driving With Dvorak. There are an amazing number of retired English teachers in this picture! 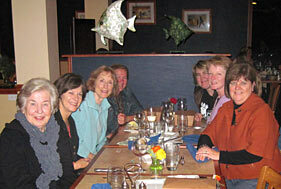 Jane Allensworth, Millie Saylor, Kate Rosso, Gigi Harris, Julie Fairbrother, and Shelley Donaldson at the Blue Pelican in Central Lake, MI. Their book club drove from Birmingham, MI to northern Michigan for a guided tour of the cottage I describe in Driving With Dvorak.